This bridge is located at the back of my grandfather's house. Very simple one; but still useful. Every time acrossing it; I always walk very slowly. Don't you dare walking on it? The roundness of the bamboo would worry me, but the whole path looks a lovely place to walk. Very nice photo. I love the bamboo bridge. It's very charming. I, too, love your bamboo bridge. I walk slowly and carefully across our wooden one here at the house. There is something very beautiful about this shot. The light is lovely as it is bouncing off the bamboo. Nice composition. 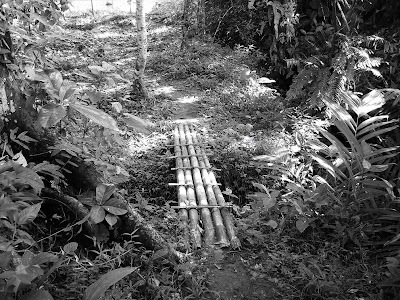 I remember walking in those bridge when we go to forested places with small streams in Philippines. Made me nostalgic, Lina. Happy Sunday! This photo is nice! Thanks for visiting me. I'll include this blog in my links, if you don't mind.